Begum Rokeya Sakhawat Hossain, the legendary Bengali writer-activist whose leadership had transformed the lives of thousands of people in this region and beyond, was born on this day in 1880. Incidentally, she died on the same day, 52 years later. For those who may not know, Begum Rokeya was an advocate of women’s rights in the Indian subcontinent during the British rule. Through her charismatic and resilient leadership, she defied all obstacles put up by a society that barred women from pursuing their dreams. With a sound knowledge of the history of the region and the challenges facing the time and society in which she lived, she was a woman far more advanced and progressive than her contemporaries. Through her writings, she raised her voice against the challenges and had the vision for the emancipation of Bengali Muslim women at a time when it was unthinkable for anyone to think so. She showed how a misinterpretation of Islam and a deep-seated patriarchal mindset in society combined to keep women behind doors, and deprived of their rights. Begum Rokeya was born in a village called Pairaband in what is now Rangpur. Her father was a well-educated landowner and had a keen interest in education but maintained a strict rule of the Islamic code of pardah (veil) for the women in the family. That is why, while her brothers got the opportunity of schooling, she was deprived of education. Rokeya and her elder sister, Karimunnessa, were deeply interested in learning Bengali and English. Their elder brother Ibrahim, who had a great influence on their lives, taught them the languages. They did that at night, while everyone else was asleep, so as not to arouse anyone’s suspicion. She got married at a very early age and had a huge age difference with her husband, Khan Bahadur Sakhawat Hossain, then the deputy magistrate of Bhagalpur. He, however, supported female education and helped his wife improve her Bangla and English skills. Gradually, she mastered the two languages. Her husband also encouraged her to write and Rokeya eventually adopted Bangla as the principle language of her writing. The role of these two men in her life was crucial and needs to be recognised, so that today’s men can understand the importance of their own role in the transformation of the lives of women in our society. Rokeya’s writings mainly revolve around the oppression of women. Prominent among her works are Sultanar Swapna (Sultana’s Dream), Padmarag, and Abarodhbasini. In 1905, she wrote Sultanar Swapna, one of the earliest depictions of feminist utopia. In it, she relies on role reversal to show the society what women are capable of if given the opportunity. In Abarodhbasini, she reveals the absurdities of the society, and in Padmarag, women are seen gathering the courage to change their lot by becoming educated and financially independent. Rokeya also wrote several other novels and short stories. She always believed that women were held back by their ignorance of their own rights and responsibilities. In 1909, she set up the Sakhawat Memorial Girl’s School immediately after her husband died, the first school for Muslim women in the region, starting with five students. She went from door to door, trying to persuade Muslim families to allow their daughters to attend school. She ran a slum literary programme in Kolkata, forming work teams to visit women in the slums to teach them reading, writing, personal hygiene and child care. 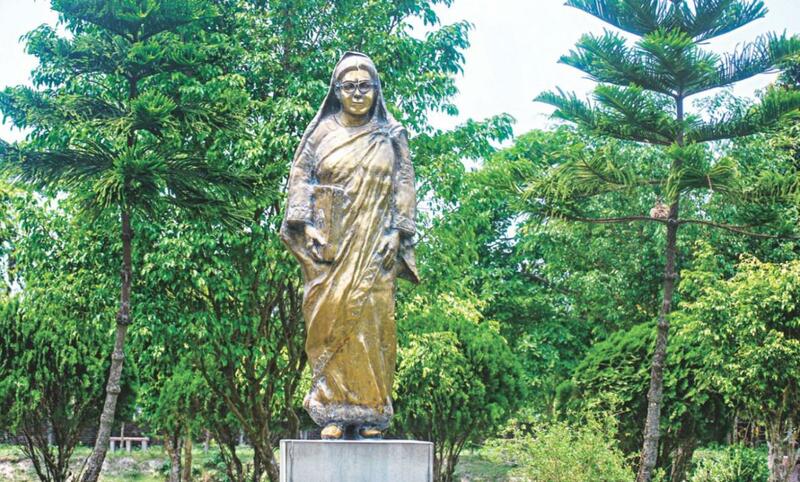 Begum Rokeya was a self-educated and self-reliant woman with a progressive bent of mind. Her leadership followed the transformational feminist style which is reflected in her works. Through her writings and activities, she sent a message to the women to prepare themselves to claim their rights and privileges and to help construct a better, more just society. It is surprising that such a message would come from a young Muslim woman from the colonial Bengal. She was the first woman in her society to talk about gender equality. She said, “We [women] constitute one half of the society, and if we are left behind, how can the society progress?” She realised that lack of education and low level of literacy make access to opportunities limited, and commonly undermine the confidence needed to enter public life, be it in a village, or community, or at the national level. She raised her voice through her writings and worked hard to uplift the lot of women, by instilling a sense of renaissance in them and emboldening them to taste freedom, swimming against the current of patriarchal social views. Rokeya also recognised the importance of women’s economic independence. She realised the importance of organised action for change and raising public awareness. In 1916, she founded the Anjuman-e-Khawateen-e-Islam (Muslim Women’s Society), an organisation that was at the forefront of the fight for women’s education and employment. Its members advocated for women’s legal and political rights, sponsored women’s attendance at school, gave shelter to orphans, offered legal and financial assistance to widows. It was the cornerstone of the feminist movement in Bengal, and paved the way for the vibrant and politically progressive feminist movement seen in contemporary Bangladesh. Till her last days, Begum Rokeya was busy with her writings, activism and social work. Her leadership, particularly in the context of the early 20th century, had amplified the impact of women’s life in undivided India. Rokeya’s words and messages are still very relevant to our current time and society. Her foresight, tolerance and broadmindedness can still guide women who want to pursue their dreams against all sorts of intolerance and religious bigotry. No wonder she is still a towering figure in the women’s movement and a guiding light for thousands of women leaders. Mitali Jahan is a lawyer at the High Court Division of Supreme Court of Bangladesh, and Programme Manager at Human Rights and Legal Aid Services Programme, BRAC.